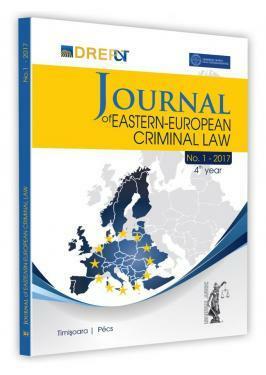 With its fourth issue, the Journal of Eastern-European Criminal Law has already become widely spread, a fact which is proven by the rising number of contributors and the diversity of the countries to which they belong. We have intended that the Journal, edited semesterly, to be open to all researchers in the academic area from the Central and Eastern‐European countries, to professors and PhD students, as well as to judges, prosecutors and other professions concerned about the evolution of criminal legislation and the more intransigent response that needs to be given to the new forms of crime. For the future, in addition to the unifying topic dedicated to each issue of the Journal, a separate section will contain articles and studies that are closely connected to the research activity of each contributor, thus offering researchers an opportunity to have their scientific findings disseminated, in order to generate a forum of debate of current issues of European Criminal Law. We propose that the main topic of the next issue of the Journal be the following: “Migration, Trafficking in Persons, Terrorism and Criminal Law”.